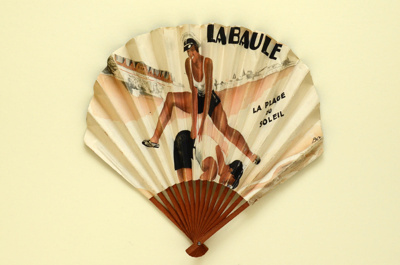 Folding fan – forme ballon – with wooden monture stained brown. Double paper leaf printed on one side with a couple playing Leapfrog on a beach at La Baule. The other side is printed with the head of a male holding up to his face a bottle of Contrexéville mineral water. Both sides, signed DON, are typically rendered in the artist’s bold, graphic style.